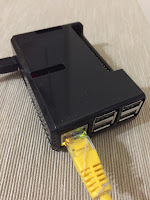 If you wish to make a standalone router, file server, or satellite weather station, then you need a little computer to make things happen. At this time, the most popular embedded Linux machine is the Raspberry Pi. It is a delightful little design - tiny and very useful. The default system is Raspbian, which is loosely based on Debian. This is excellent. Years ago, I tried a Beaglebone Black and it came with a cripple version of Angstrom Linux which I didn't like and the board is consequently lying somewhere in my junk box. The Raspbian system is aimed at clueless newbies and the ssh daemon is disabled by default. To use it as an embedded server, without having to plug in a keyboard and screen, you need to add one line to a configuration file, before you plug the SD card into it. Here is how to do all that. If necessary, re-insert the SD card and mount the root directory (don’t bother with the boot directory). Umount and Eject the card. Now when you hook the Pi to your router, it will get an IP address via DHCP and then run sshd automatically the way the Linux gods intended it to be. Now do Update followed by Advanced, Expand Filesystem. Then do Finish, Reboot, Yes. With four 256 GB USB flash memory widgets plugged in, you can make a 1 TB solid state file server for about 1100 Dirhams - something that was unimaginable just a few years ago. A file server doesn't have to be fast. It is limited by the network speed, not the processor. So a little Rpi makes a very cost effective file server. ...and ditto for the other one. So the access problem is solved without having to read another manual on disk mounting and with that, I now have 512 GB of online solid state storage, accessible over ssh and scp. These Sandisk USB watchammacallits get very hot and there are long stories on the Sandisk forums about heat problems. So removing them from their plastic packaging is actually a good idea, since that improves the air flow over the chips. The good news is that most people say they last for years, despite the heat. The IP address of the Rpi was added to /etc/hosts, so I don't have to keep typing it in. One's natural instinct is to make a backup script that includes all the files that one needs to backup - that is wrong! The trick with a backup script, is to keep it simple and include everything in your home directory and then exclude a few generic things. That way, the script is maintenance free and will always work, irrespective of how you move files around. The max-delete protects against catastrophes and max-size prevents making backups of large ISO files and movies, since those things can always be downloaded again from wherever they came from. Note that Windows 10 now finally supports OpenSSH, so you could also connect securely to a sshd server with sftp from the latest Win10, but not from Win8.1 or Win7. A hard link is an additional directory entry for the same file. When you delete hard links, the file will only disappear, once the last hard link is deleted. This is much better than soft links, where you can delete the file, leaving a bunch of broken links all over the place, with no easy way to clean up the litter. You can perhaps think of hard links as smart links and the other as soft in the head links.